Each year, for Christmas and for my birthday, I will be asked to write up a wish list to help people shop for presents. When I create a wish list, I always like to include some slightly more expensive presents that I’m sure no-one will get for me. The reason I do this is because I think that it’s good to wish for such stuff – firstly if someone gets it for you, then awesome, but it also means that you won’t know exactly what you’re going to get. There’s always that bit of a surprise. However, there are a lot of things out there that I’d love to put on the wish list but are even further above the price range that it would be just silly. So I thought today I’d list 5 things I’d really love to have on my wish list, but are stupidly expensive. This is an awesome keyboard that takes customising to the max. Each key has an OLED screen that you can program to change depending on what you’re doing. Working in Photoshop? Each key can show the shortcuts. Playing a game? It can show animated GIF’s to show what macro is assigned to it. I would most likely program the keyboard shortcuts for Sibelius (which would be most awesome). Bit expensive, but if I was working on these sorts of programs often, it would be totally worth it. I’ve loved Maton guitars for a while, and would love to get a “Maton Set” of an acoustic and an electric. Would be expensive to get these two – the most expensive at The Rock Inn, but the tone would be worth every penny. I love Star Trek, and The Next Generation is my favourite series. While this one is slightly possible, as I will most likely buy the single series over time, I’m putting this up here because the complete box set is something that I would never expect anyone to buy for me. Carbon Fibre bows are the future of violin bows. With a dwindling supply of Pernambuco making it ever more expensive to make new pernambuco bows, carbon fibre has turned out to be a cost effective method of making really fine bows. This Maestro bow would perform to a similar standard of a $8,000-10,000 bow. Bugatti Veyron 16.4 – Price: a lot. I was just going to put a car, but seeing as it’s my crazy list, I may as well put the craziest of all cars. 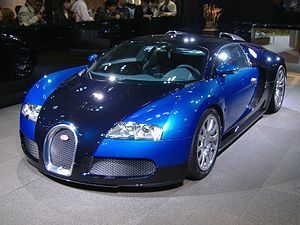 The Bugatti Veyron, the worlds most powerful car, offering 1,001 horsepower. It has a top speed of 407km/h. My memory puts the cost at over $1,000,000. If you’re dreaming big, you can’t get much bigger. So that’s my crazy wish list. What’s yours?